Where to buy round wood handrail fittings and returns? 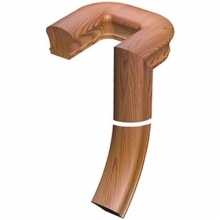 A complete line of hardwood handrail fittings for our ADA wood handrail profiles are available for every handrail with the exception of round. 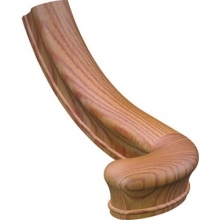 Round wood handrails have only 3 fittings available: Up Easing, Over Easing, and 90 degree level quarterturn. In fact, there are really only 2 fittings offered because an up easing and an over easing are one and the same part when it comes to a round handrail, because there is no detail to the profile. Red oak, poplar, and hard maple handrail fittings are in stock for quick ship. Some wood rail fittings are in stock in american cherry. White oak, brazilian cherry (jatoba), soft maple, african mahogany, santos mahogany, lyptus, walnut, hickory, ash, birch, white pine, yellow pine, alder and antique heart pine, have a 2 week lead time to manufacture. Hardwood railing fittings are manufactured with very tight tolerences so that they match up to our wood railings and wood bending railings perfectly. Custom railing stair fittings can be manufactured custom.